When singer/actor Nick Jonas proposed to Indian superstar Priyanka Chopra this past summer, the two knew their wedding had to be a meld of their cultures, religions and families. Priyanka Chopra was so emotional during her wedding to Nick Jonas that she couldn't hold back her tears. A new stunning portrait of the duo is gracing the cover of the current issue of People Magazine. The actress and the pop star wed over the weekend in a five day, 225 person extravaganza in Jodhpur, India. The magazine cover shows an image of the happy couple from their Christian ceremony which took place on Saturday at the Umaid Bhawan palace. 'Every girl dreams of being a princess on her wedding day,' Chopra told People. 'But I never had a plan about what I wanted it to be.' 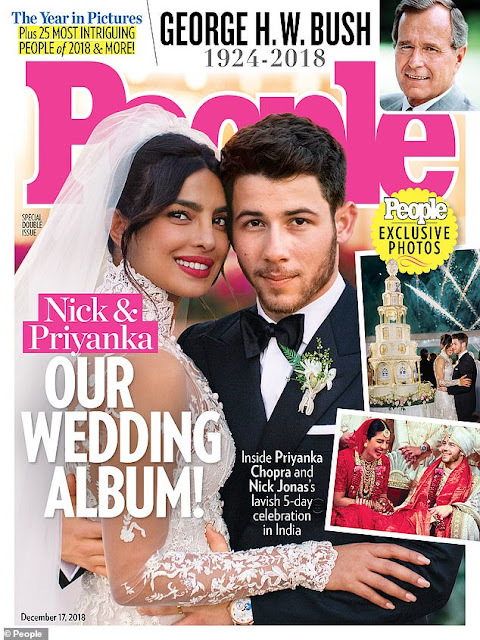 Nick and Priyanka had a multi-day wedding that included both a Christian and Hindu ceremony that the actress called 'religious mash-up.' 'It melted my heart,' the beauty said. 'Being able to have two big weddings, in India, with our closest family and friends was unbelievably special.' The magazine cover shows Priyanka in her bespoke white Ralph Lauren gown, which took a total of 1,826 hours to complete and featured two million mother of pearl sequins. During their Christian ceremony, which was presided over by Nick's pastor father, the couple reportedly served up an 18-foot wedding cake to their guests. 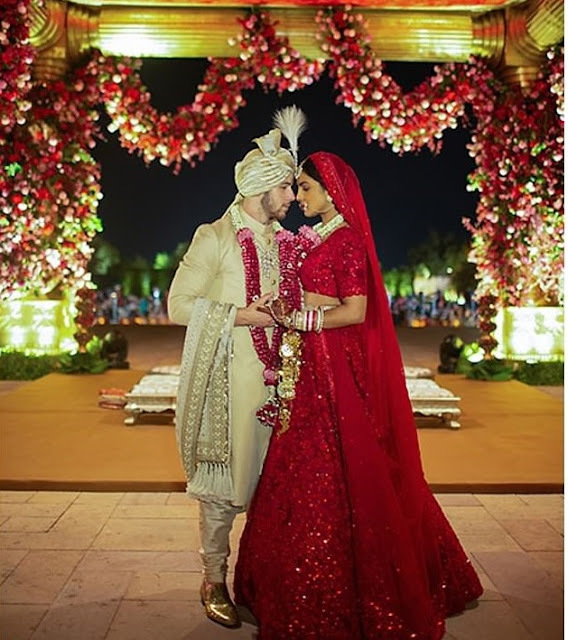 'We took beautiful traditions that we both grew up with and personalized them in a way that made sense for us,' Priyanka told People. 'It's been incredible to find the commonalities between our beliefs and figuring out how to blend them in a respectful and meaningful way.' For the Hindu ceremony, the bride stunned in a deep red lehenga - a traditional Indian outfit by noted designer Sabyasachi Mukherji. According to the Bombay Times, the day started at Umaid Bhawan Palace in Jodhpur, India, with a two-hour breakfast program followed by the traditional haldi ceremony at 12:30 p.m. Keeping with tradition, the American musician joined his Indian actress bride, according to the Bombay Times, and both took a ride on an elephant around the premises of the palace before arriving at the main wedding area. The wedding was followed by an elaborate dinner and the after-party with music and dancing that apparently went late into the night. The internet seems like they're in full support of Mr and Mrs Jonas. Chopra shared two official wedding photos to social media on Tuesday of her nuptials and within just three hours the images had garnered over six million likes combined. The shots that the Bollywood star shared on social media, which were also published Hello! Magazine, show the actress and her new husband from their two ceremonies. 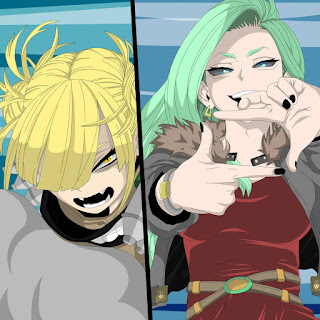 The couple still has a ways to go if they want to beat the most liked Instagram post of all time. That honor belongs to none other than Kylie Jenner who's first photo of daughter Stormi boasts 18 million likes. Nick popped the question to Priyanka in London on her 36th birthday with a ring from Tiffany's.